A Swiftair Boeing MD-83 left Kigali, yesterday evening to Bamako, Mali, where 140 police officers will be de ployed under the MINUSMA (United Nations Mission in Mali). The maiden contingent to serve for one year in the West African nation includes 17 females. The contingent will be headed by Chief Superintendent Bértin Mutezintare. “Make good use of the trainings and preparations you received to fulfill your mission assignments to bring about peace in Mali,” the IGP told the officers at the Police General headquarters in Kacyiru. He urged them to raise the country’s flag high by acting professionally and upholding discipline. He also told them to stick to the force’s core values and be good ambassadors. 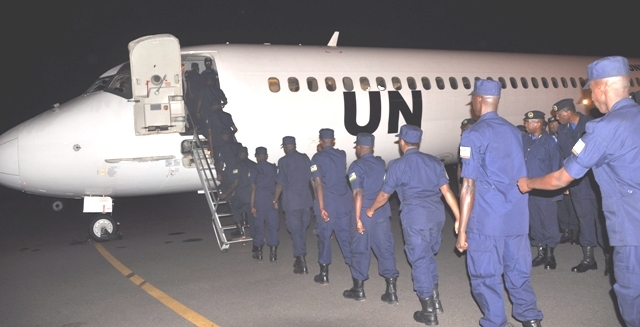 Rwanda maintains about 600 police peacekeepers in eight missions including Haiti, Sudan, Liberia, Ivory Coast and South Sudan.